Navratri is just around the corner and my facebook timeline is full of pre-events and people planning in advance. Falguni Pathak was in town just last week and it pretty much kick started the whole Dandiya/Garba fever. Irrespective of the community one belongs to or where they are from, Dandiya craze catches on. I, on the other hand, am not a very Dandiya friendly person. It sure involves one of my passions – Dancing. But it also brings to fore my social awkward behaviour around strangers in a dance-type setting. This is the same reason, ‘Going to a Nightclub’ is not on my bucket list. I’ll clarify a few things here. I am a very social person generally. I will not be joking if I said I am a very happy smiling person around acquaintances and strangers even. And crowds make me jubilant. As long as it is an audience. I am somewhat of a performer, you see. If it is me on the stage, dancing, facing an huge audience then you will find no person happier than me. But dancing with scores of people you do not know gives me the creeps. So my Navratri nights are pretty much spent at home, playing dress-up with my little cousin. Social awkwardness does not get in the way of me getting all decked up! 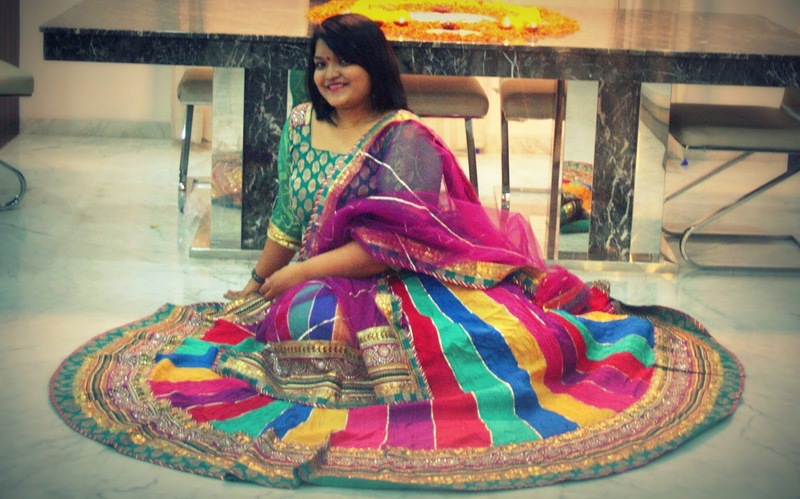 Sharing a few picture of my FAVOURITE lehenga which my Papa bought for me as a gift in 2011. 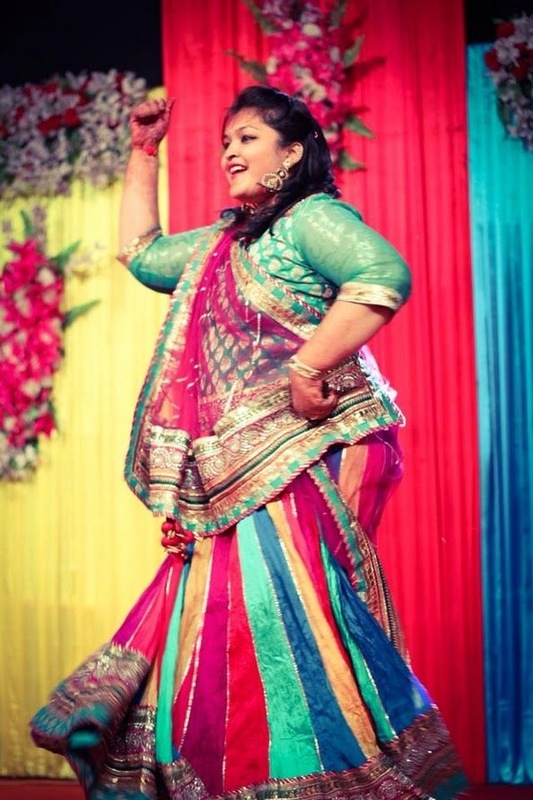 The Lehenga is from Jodhpur and what I love about it is that it is a crazy colourful rendition of me on fabric. And the Gheraa (flare) of the lehenga makes it a perfect wear for a dance performance related occasion. 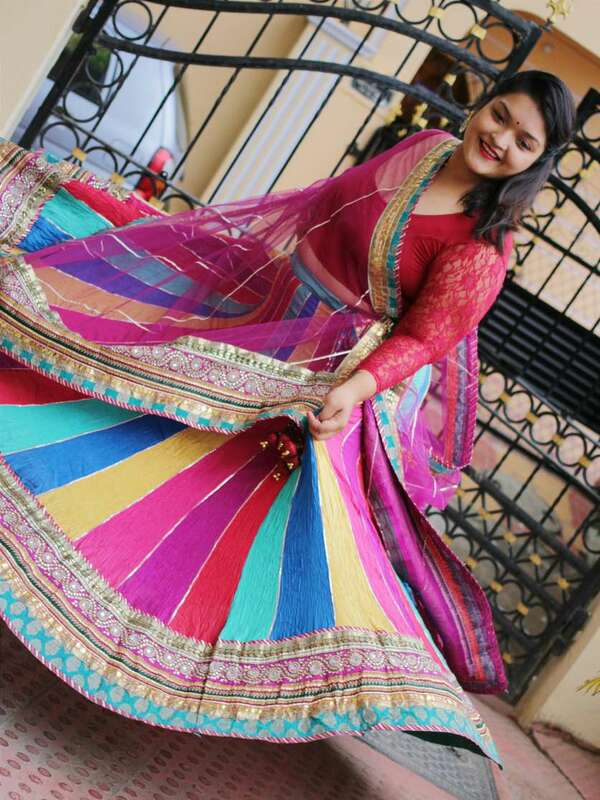 No matter what your fashion weeks say about pastels and nudes, bright colour is the way to go if you are going Navratri shopping this weekend.